Did you realise that your company has a language? Or that your industry has a jargon? And that those often (most of the time) differ from your customers’ language? When the two collide, this becomes a customer experience nightmare. Have you ever been on a flight and heard the pilot announce: They have some flow, and we were able to get some of their passengers bumped up into our flight? That happened on a recent flight of mine that was delayed as we sat on the tarmac. What is flow? I still don’t know. I wonder how many other passengers knew what that meant? Why did the pilot use that word? Because it’s in his vocabulary, not in his passengers’. He probably didn’t even think about that. Here’s another example from a visit to a local lab to have some blood drawn. 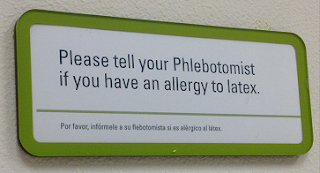 Do you know what a Phlebotomist is? I’m betting not many people do. That was the first time I’d seen that sign in any lab. Honestly, it was the first time I’d ever seen that word. Whoever designed that sign probably knew the word and assumed everyone else does, too. Good thing customers can just Google the word while they’re waiting for an hour to be called for their turns. It shouldn’t be that way. The language you speak needs to mean something to your customers. When you use acronyms or industry jargon, you’re simply confusing customers. Customers can go elsewhere to find another company that understands them and that they understand. That’s the price you’ll pay if you don’t consider this important topic. While you don’t want to seem overly simplistic in your explanations or conversations, especially when you’re talking about something very niche or purely product technical, don’t assume the customer understands your products and your technical language or terms. That doesn’t mean you have to “dumb it down;” you just need to use the right words – words that your customers can spell and define. And don’t leave out information simply because you don’t think the customer will understand. Put the information in her terms and explain it well; she’ll believe you have her best interest at heart. You’ve bought yourself some goodwill. And earned some trust. Don’t use acronyms, internal product names, industry jargon, or other company speak; be sure to train and coach employees on this regularly. Depending on how ingrained that jargon is in your day-to-day, this could be a bit of an effort, but it will be worth it. Listen to cues from customers. Is there a blank stare, silence on the other end of the line, or an expression of confusion? Customers will let you know if they don’t get it. Pay attention. Get feedback from your customers about your messaging and communications, e.g., your signs, brochures, websites, product packaging, etc. Think about all the different ways that you communicate, and make sure there is a consistent, customer-friendly language used across the board. 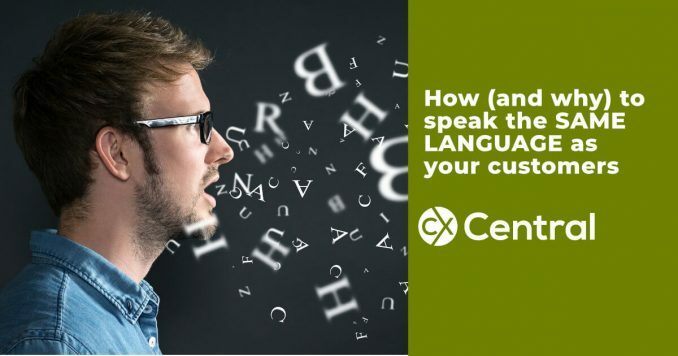 Learn and adapt to your customers’ language. Do they refer to your products the same way you do? And do they actually speak the same language (English, German, etc.) that you speak? If not, make sure your messaging and communications are all available in their language. Understand your customers, their needs, and the jobs they are trying to do; then talk about the benefits of your products and how they will help customers do what it is that they need to do. That’s the language they want you to speak: how can your product help me? how can you help me? what does this do? how do I fix it? It seems like a no-brainer that companies should be doing this. It also seems like there’s a quick, easy fix to something that frustrates customers and makes the experience more difficult than it has to be. I gave you two examples of industry-specific language used to communicate with customers, and I know there are plenty of others. Without a doubt, you can come up with a few of your own. So, think about how you communicate with your customers. Then walk in your customers’ shoes, understand them, speak in their language, earn trust, and build long-term relationships. I don’t know the rules of grammar. I originally wrote today’s post for Clicktools. It appeared on their blog on November 28, 2016.